Measuring media relations success has to start at the top. Meaning, before you start collecting insights from your coverage, you need to have a benchmark of what your ideal story is, and everyone, from the CEO level down, needs to be in agreement about what that is. This was the central media relations tenet expressed by Visit Philly’s communications team at PR News’ recent Measurement Conference in Philadelphia. Paula Butler, VP of communications, Dana Schmidt, director of social media, and Kevin Lessard, senior analyst, have a clear idea of what the perfect story is for Visit Philly, the official visitor website for Philadelphia travel and tourism. Obviously, every organization has its own version of what its ideal media story is. But unless you hash it out with the C-suite on down the line, measurement efforts and the reporting of metrics will quite likely result in so-what shrugs and glazed expressions. Coverage by topic—This drives Visit Philly’s content strategy. What performs well, and when? Coverage by type of placement—Visit Philly places an emphasis on driving more feature coverage (vs. mentions). Coverage conveying key messages from a corporate standpoint. 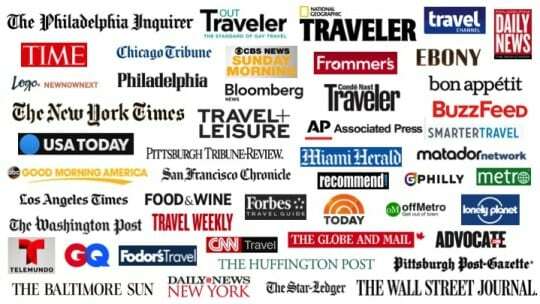 Coverage in A-list media—For Visit Philly, A-list media comprises local, regional and national travel/lifestyle outlets (see image above). All efforts to pinpoint a brand’s ideal media story and select the right metrics go down the drain without meticulous tracking and smart repurposing of coverage for internal and external stakeholders, Lessard said. Beyond sharing coverage on social media, you should consider repackaging media coverage in the form of a regular e-newsletter sent to employees and boards of directors. You helped create the good news about your organization—be creative about distributing that good news. In a New York Times interview earlier this month, Deadpool actor Ryan Reynolds revealed he suffers from anxiety. When asked how he manages his condition on stressful press tours, Reynolds said he is one of the over 15 million people who have downloaded guided meditation app, Headspace. Ryan Reynolds is a fan of the Headspace app. Apps designed to improve mental wellbeing have skyrocketed in popularity over the past five years. Most of these focus on managing stress and anxiety, in particular overcoming panic attacks. However there have been concerns raised about the quality of many of the supposed mental health apps currently available for download. Last year, the American Psychiatric Association assessed more than 10,000 depression and anxiety related self-help apps available for download, finding fewer than 1 per cent had been professionally evaluated. Evidence for meditation programs having a moderately positive effect on psychological stress exists, although research is limited. Last year, the federal government announced $2.18 million in funding for the Black Dog Institute to conduct a five-year trial of mental health apps involving 20,000 teenagers, assessing whether the technology can – in their words – “inoculate” adolescents from developing depression after a year of use. However, the number of apps on the market which administer guided meditation in a potentially clinically useful way appears to be small. A 2015 Queensland University of Technology evaluation of mindfulness-based iPhone apps, assessed the 560 unique apps found when searching for “mindfulness” in Apple and Google’s respective application stores, finding only 23 did more than simply remind a person to meditate, time their meditation, or provide support beyond a non-interactive guided meditation track. Of those 23, Headspace was the study’s top-scoring app. Dr Kym Jenkins, president of the Royal Australian and New Zealand College of Psychiatrists, says problems can arise if people use smartphone apps as a substitute for gaining face-to-face mental health care. “Mindfulness mediation apps can be useful for some people, but for others, when unwell, using these apps or even engaging in mediation its self can be quite difficult,” she says. Some mental health professionals have started to integrate the apps into their therapy programs. Melbourne clinical psychologist Dr Melissa Keogh recommends her clients complete 10 minutes of mindfulness meditation each day, and encourages them to use the Australian-made app, Smiling Mind. Similar to Headspace, Smiling Mind is a free mindfulness meditation app. Developed by a team of psychologists, and offering meditation programs for children, teenagers and adults, it has been downloaded over 2.6 million times. For Dr Keogh, apps do not replace sessions, but provide her clients with a more structured way to do their prescribed daily meditation. She says her clients report a reduction in stress and anxiety symptoms when using the app. “Before the advent of the iPhone and apps I used to teach deep breathing exercises and progressive muscle relaxation via the reading of a script in-session, to help clients with stress and anxiety,” she says.